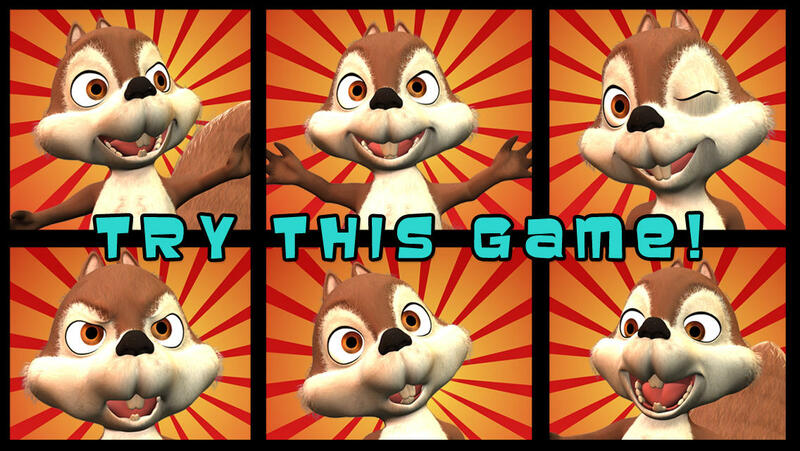 James the squirrel is back for a new fantastic game adventure. James is really hungry and he is trying to get as much nuts as he can. Unfortunately for him it will not be an easy task for him to reach his favorite food, because the path between him and his food is littered with traps and obstacles. Your task will be to help James get to his nuts. Overcome all the obstacles and use all the helpful elements to make the food reach James. To start pull the sling and shoot the nut or simply move the nut with your finger to the right place and let it fall into the labyrinth. If you would like to get 3 stars and reach a higher score you will have to collect all the stars, before the nut reaches James. The Air Frog: You can activate the big frog’s high pressure blow when the nut is about to fall out of the game or simply to change his direction. Spring Gift: If it exists in the level it can represent your last hope to prevent the nuts from falling out of the game or to try and reach your goal. It is activated with your touch. Flippers: Drag/pull the rings to move the flippers and give the nuts a fast flick like you would do in a pinball game. Warning: When you meet the volcano you will have to find the right moment to release / shoot the nut, otherwise it will be burned. Advise: The huge clumsy, Snake can be used like a fast slope, simply slide down his back. But you will have to pay attention to his head as you might get stuck / blocked. If you hit the big leaf he will reject you and make you bounce strongly against everything you might encounter on your trajectory. The gearwheels works like a conveyor belt; it will stop your bouncing and transport you to another place before he drops you off. In some levels there are classic cargo boxes blocking your way. You can touch them to crash/destroy them and free your way. The teleport between the 2 sticks will beam you to a total different place on the board. The squirrel cannon blast: Use the red bullets to divert the super nut’s direction or to steer it to your goal.